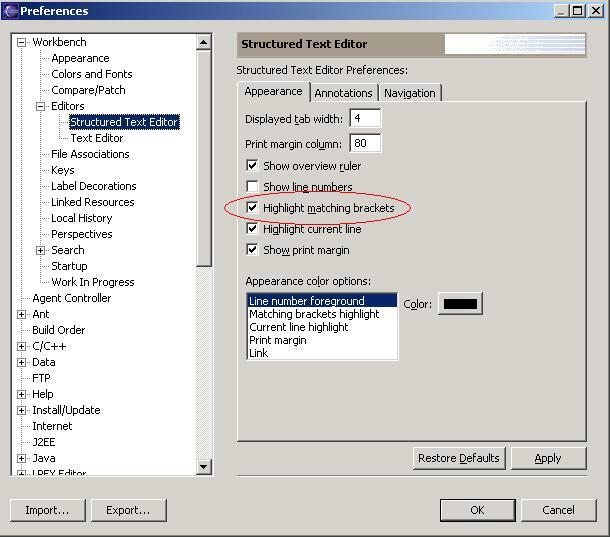 In addition to the end-user features, the SSE editors are intended to be easy for others to re-use as the source page in multipage editors. One obvious example is as the source page of a WYSIWYG HTML editor. 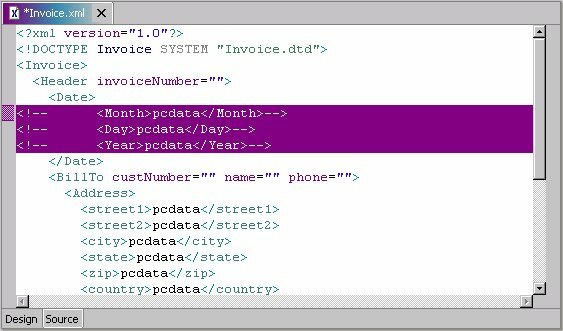 Programmatic interaction with the text model can be accomplished with standard Eclipse text document APIs (e.g. replace) or through standard DOM APIs. We provide a custom DOM implementation that tolerates ill-formed text and that allows for easy integration with other models. An additional component provided is the Snippets view. This provides a type of "clip book" where plug-in providers and end-users can store their favorite bits of code to drag-and-drop into an editor. The code in this initial proposed contribution is a snapshot "midstream" of our move to Eclipse 3.0. 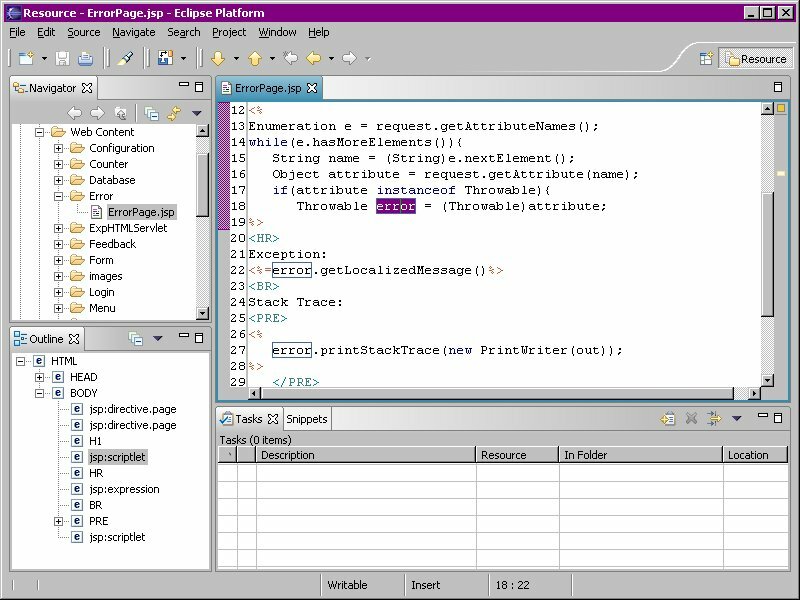 There are many bugs and much more to be done integrating with functionality provided in the base Eclipse text infrastructure. However, there's plenty to try out already. So give it a spin, and let us know what you like and don't like. 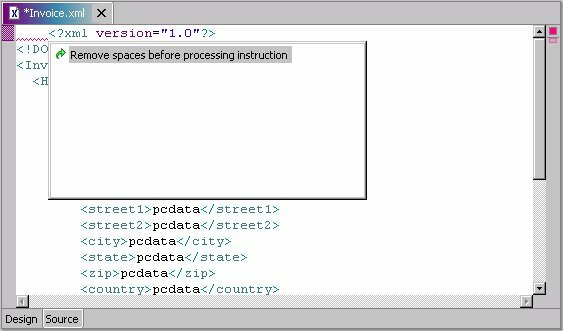 Hopefully all the introductory "standard" editing features would be discoverable by anyone familiar with Eclipse's other editors. Therefore, we've just listed basic features in the following tables. Later in this section we've collected some "new and noteworthy" notes we've written while moving to Eclipse 3.0. Validating as-you-type Y Y Y N N Y N ? Background Jobs and Progress View For a consistent "look and feel" we are taking advantage of the new-to-R3 background "Job" class and Progress View for loading content models (instead of having our own thread, and using status indicator as we did previously). Java HoverInfo Information about symbols within Java code sections will be shown in its HoverInfo. 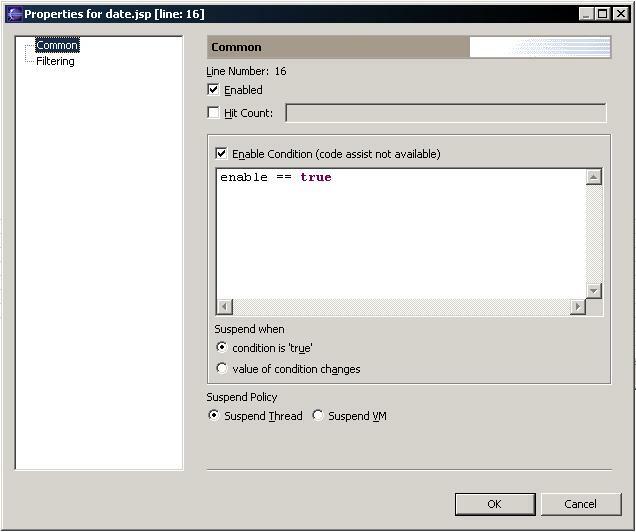 Java code as-you-type validation The JSP editor now provides for dynamic syntax checking of Java code sections. 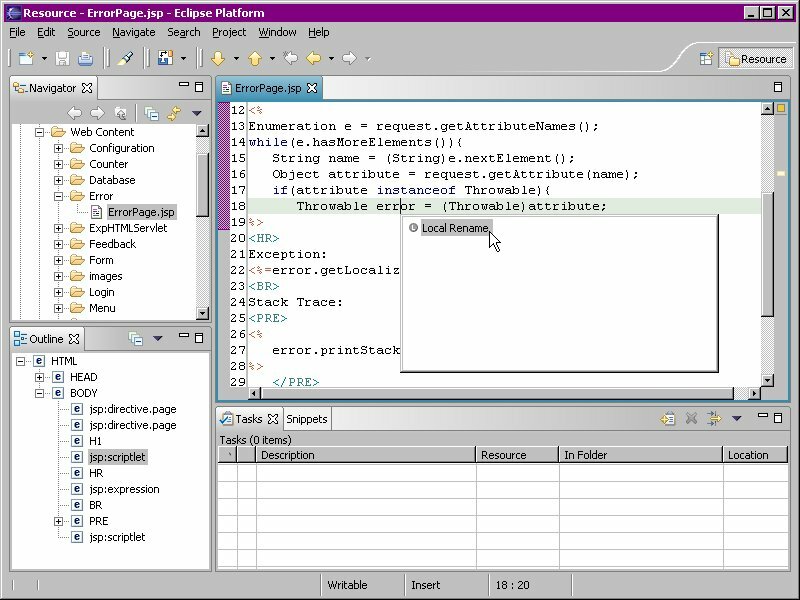 Improved debugging support (JSR-045) Breakpoints set within the JSP editor can now be triggered in JSR-045 compatible servers. Apache Tomcat versions 5.0.2, 5.0.12, 5.0.16, and 5.0.25 have been successfully tested. Details are discussed here. 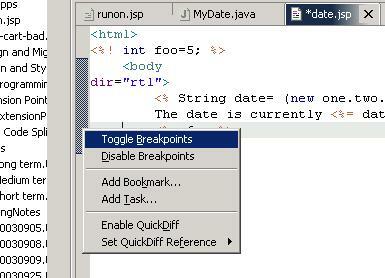 The JSP editor supports setting conditional breakpoints with JSR-045 compatible servers. This is done using the vertical ruler's context menu. Note: this requires additional entries to be made on the JSP project's classpath. See Eclipse bug 51348 for details. 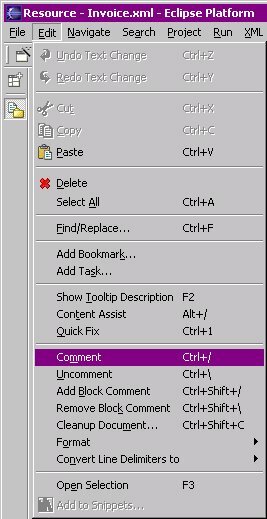 Comment and Uncomment from the Editor pulldown menu can be used to comment each line in a block of selected text in the XML Editor. If no text is selected, the current line is commented. 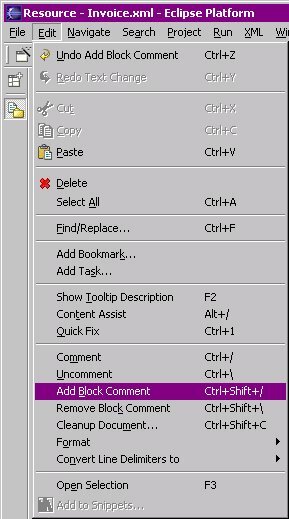 Add Block Comment and Remove Block Comment from the Editor pulldown menu can be used to comment all elements in a block of selected text in the XML Editor. If no text is selected, the current element is commented. Quick Fix and Quick Assist Quick Fix provides proposals for fixing validation errors and warnings. Quick Assist provides proposals for common tasks. Here is a list of Quick Fix proposals currently available. More proposals will be added in future milestones. Local Rename is the only Quick Assist proposal in this milestone. More proposals will be added in future milestones. 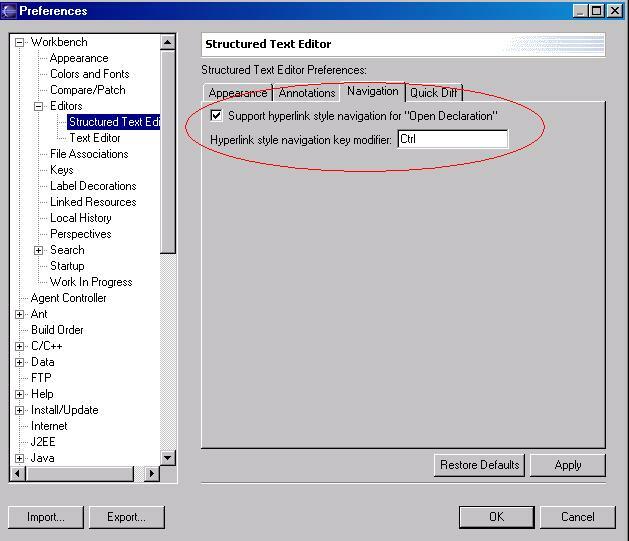 In previous versions, users were able to open on/navigate to the source/declaration/referred to file of certain tag attributes by using the Open Selection menu item (shortcut key F3 by default). This support has been extended so that in addition to selecting the tag attribute and pressing F3, users are able to use a combination of pressing a modifier key (the Ctrl key by default) and their mouse to hover over the tag users want to open selection on. A hyperlink will then appear for users to click on to Open Selection. The Source editors are now tied into the base Quick Diff support, allowing users to see the difference between their current changes in the file from either the latest version on CVS or version on disk. Source Editors now have the ability to find occurrences of a language element in a file. 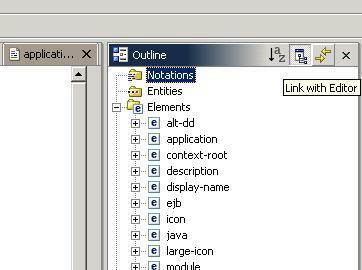 A user can now search for an element name, attribute name, attribute value, or a Java element (in the JSP Editor). To do so, press Ctrl+Shift+A or use the menu "Source > Occurrences in File". Results will appear in the Search results view. 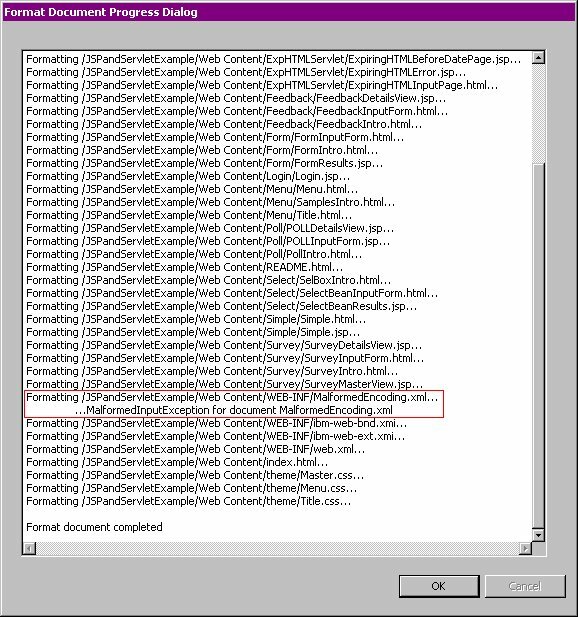 XML Example of "Find Occurrences"
JSP files now integrate with the Java Search functionality. Users can now search for uses of Types, Methods, Fields, etc. 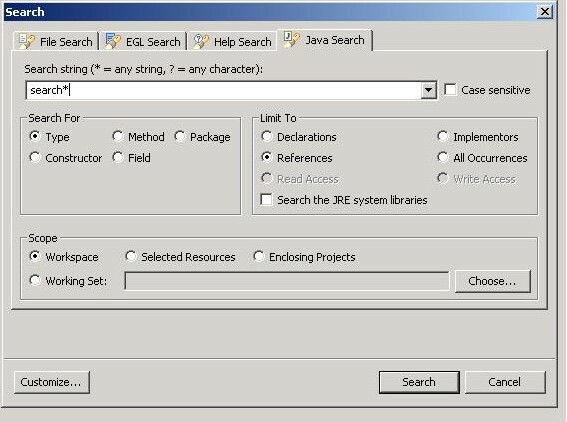 in their JSP files via the Java Search Dialog. Search results show up in the Search Results view together with Java search results. 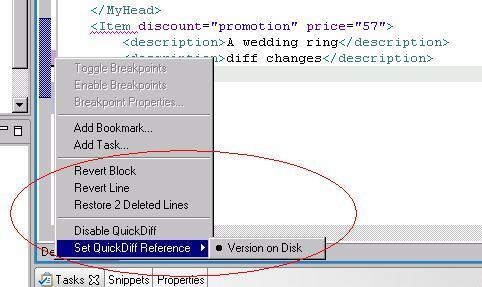 The JSP Editor now has offers Quick Fix and Quick Assist support. When the editor cursor is in a JSP Java partition and assistance is available, you may press Ctrl+1 to launch Quick Fix and Quick Assist. Local Rename is one of the Quick Assist proposals which lets you rename a Java variable across multiple JSP Java partitions. 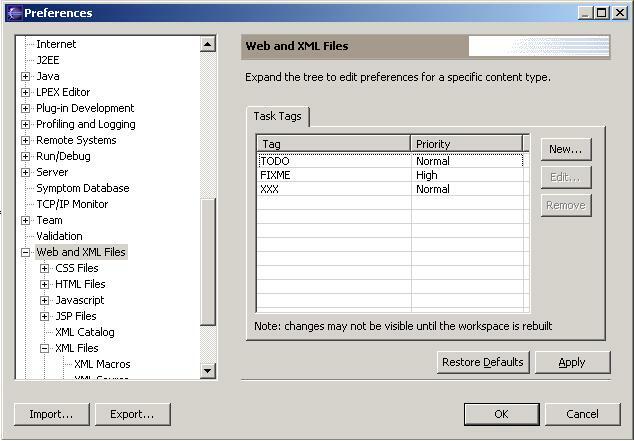 When a file of a supported content type is built, its comments will be searched for Task Tags and corresponding tasks in the Tasks view automatically created. The Source context menu, which contains Format Document and Convert Line Delimiters actions, has been added to the Navigator View. The actions can be used on a project, a folder, or a document. When the action is used on a project or a folder, the action will be applied to all documents and sub-folders in the project or folder. 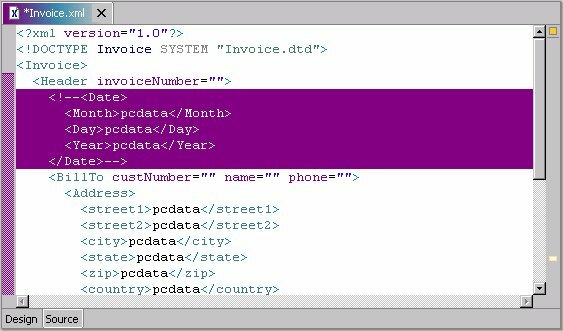 In this milestone, the Source actions only supports content types supported by the Source Editor (including XML, HTML, JSP, and CSS). Documents of unsupported content type (for example, bitmaps) will be ignored. In the future, other plug-ins may specify formatters for other content types via an extension point. The Source action progress dialog is cancellable, in case a large folder is selected by accident, or the action is taking too long. 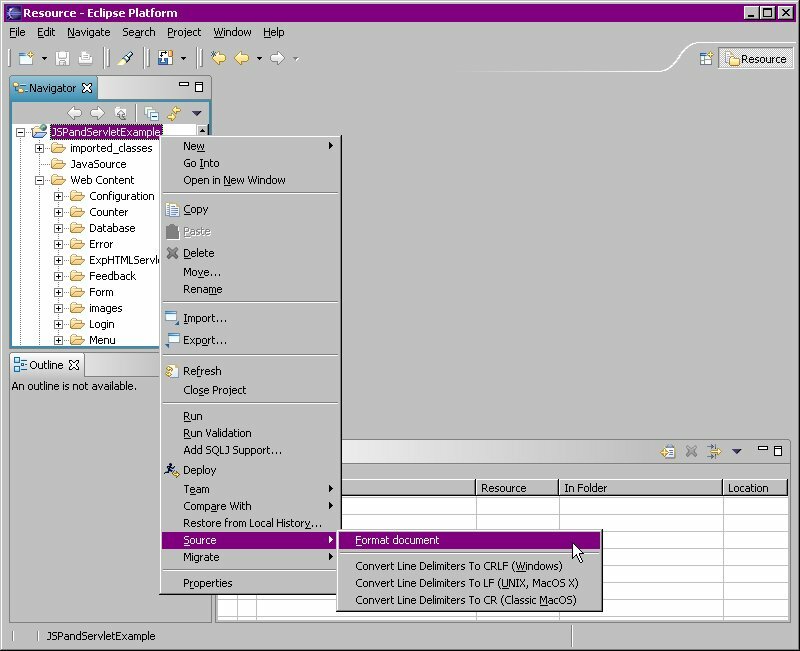 The progress dialog also shows you any exceptions the Source action encountered. Note: The UI for the Format Document Progress Dialog will change in a future milestone. 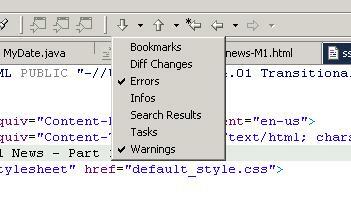 The source editor context menu now contains a menu item to change preferences relative to the current editor. 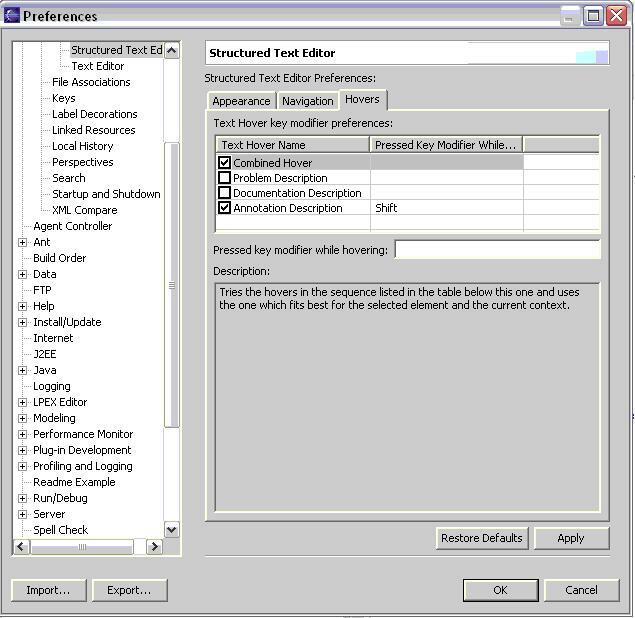 This allows users to change editor preferences easily and immediately without having to navigate the entire preferences dialog. Surround with new element - surrounds the element at the cursor with a new element. You will enter the linked edit mode after the new element is inserted. You can rename the default start tag name and end tag name at the same time. While in the linked edit mode, Content Assist is available for selecting the element name. This can be also invoked directly from the JSP source editor. 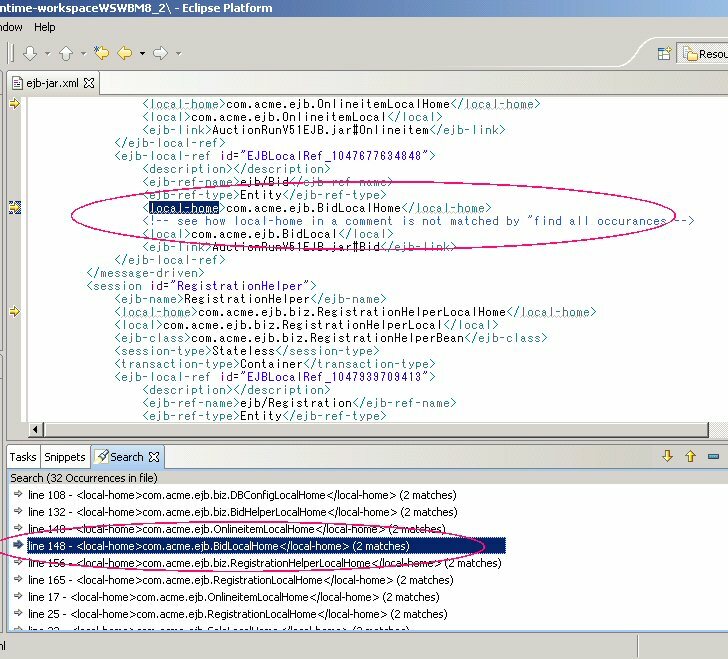 For example, with a class in a jsp:useBean tag selected, choosing Refactor...Rename from the context menu will launch the familiar Java Refactoring dialog. JSP files also participate in the moving of Java source files. 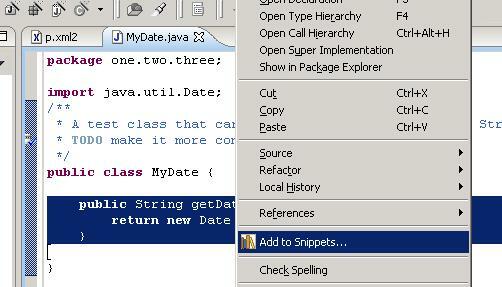 After dragging a class MyDate from "one.two.three" into the package "one.two.three.four", when dropped, the user will be prompted to update the affected JSP files. This type of refactoring can also be invoked via the editor context menu if a Java element is selected. The Customizer's Show/Hide functionality from earlier releases has been augmented with more fine-grained controls for visibility. Users may now select which content-types a drawer applies to. When editing files those content-types, that drawer will be shown. Drawers configured for per-content-type management but not enabled for that content type will be hidden. Users can configure the type of hover help displayed, and the keystrokes used to display hover help in Source Editors.